This is an In Person Signed Colour 10" x 8" Photo of the late American Singer. Howard Andrew "Andy" Williams (December 3, 1927 - September 25, 2012) was an American singer who recorded eighteen Gold- and three Platinum-certified albums. He hosted The Andy Williams Show, a TV variety show, from 1962 to 1971, as well as numerous television specials, and owned the Moon River Theatre in Branson, Missouri, named after the song "Moon River", with which he was closely identified. Howard Andrew "Andy" Williams (born December 3, 1927) is an American singer who has recorded 18 Gold- and three Platinum-certified albums. 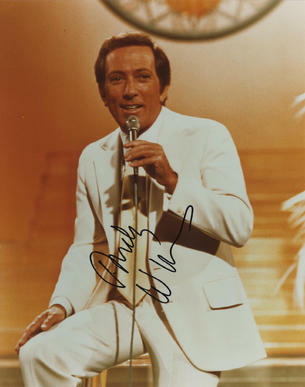 He hosted The Andy Williams Show, a TV variety show, from 1962 to 1971, as well as numerous television specials, and owns the Moon River Theatre in Branson, Missouri named after the song "Moon River", with which he is closely identified.